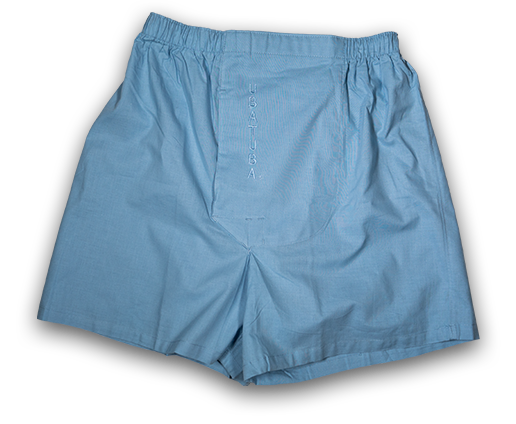 Let's face it, whoever invented the traditional boxer brief was behind the times, or, never wore his own product. Nothing personal, mind you. But c'mon...it is a flawed creation. IT MAKES NO SENSE! The center-cut fly right down the middle? That alone doomed it from the get-go—it's a masterpiece of faulty construction. Men of all ages and, er sizes, have been popping out ever since. It’s madness. And we're putting an end to it. With Ubatuba, we went back to square one. We rethought not only the construction of the traditional boxer, but the overall design. Here’s what we came up with. A boxer with a patented off-center fly. That’s right, we stuck that sucker off to the side. No more pop-outs guys!! Walk or run around freely, wherever you are, because nothing’s popping out. We went ahead and added some extra material in the front panel to help safeguard against embarrassing dribble and trouser spots. Hey, it can happen to anyone, right? You get in a hurry…you don’t quite....finish.… then disaster. We’ve all been there. Well, no more. We added extra cotton fabric up front to conceal any unwanted residue or dribble so you don't have to worry. And that extra padding adds comfort too! That's right, we threw in a secret pocket to serve as a hotel room card holder just because. Why? Because we needed it once! You never know when you may need your credit card, or license, or library card...well, maybe not. But rest assured, you could carry it back there if you wanted. You’re welcome.